The last decade has seen a significant change in the nature and pattern of migration flows within the EU. As a result one can observe a rapid change in the population structure and interactions between individuals and social groups in cities. Cities of migration are places of inclusion and exclusion. Local authorities need to deal with how to manage this diversity and find the intersection between various areas in relation to the growing migrant population. In particular, local authorities have to tackle some concrete challenges, such as: more difficult economic integration due to the economic crisis; increasing risk of social exclusion; educational achievement of second- and third-generation migrants; rise of racist and xenophobe movements; increasing diversification in the composition of immigration flows (e.g. migrants from either Member States and third countries; both skilled and unskilled migrants). Arrival Cities is an URBACT network of 10 cities to share practice, learning and ideas on how to better adapt to the changing landscape of migration. The project aims to foster migrants’ social inclusion sharing good practices between project partners, in order to facilitate local authorities facing the challenges and problems described above. In particular, the project has the objective of exchange practices on the following topics: effective use of migrant human capital; access to key services such as housing, health and education; fight against xenophobia; encourage the involvement of the private sector; e-Inclusion (use of the new technologies). The Welcome Class project is a project developed within Amadora, Portugal- the lead partner of Arrival Cities. It was presented and discussed as a case study at a recent network gathering of the Arrival Cities network which focused on the theme, Education. Many students in the Portuguese school system who originate from outside Portugal lack Portuguese language skills and subject knowledge and this presents challenges to schools. This includes students coming from Portuguese speaking African countries known as PALOP (Guiné-Bissau, Cape Verde, São Tomé and Príncipe and Angola) or Brazil, as well as students from non-Portuguese speaking countries such as Ukraine, Moldova, Russia and Romania and China. There is a discrepancy in terms of subject/thematic knowledge between that acquired through their previous education in their country of origin and knowledge required by the Portuguese system. Both lack of language skills and subject knowledge impede educational success and social integration. This requires reflection on which methodologies and strategies can allow for the constructive appropriation of the acceptance of difference, respect and coexistence with diversity, in parallel with the linguistic profile of the community. It is necessary to consider the dynamics of learning in a plurilingual and multicultural perspective that combines both the diversity of profiles and the intrinsic specificities of each immigrant student with flexibility around curriculum. The Welcome Class has evolved as a methodology of language learning conceived within a plurilingual and multicultural context. It is an initiative aimed at young immigrants to provide them with extra support and education around learning the Portuguese language. It is based on activities of linguistic immersion and extends beyond language learning to learning about culture and customs. This is a model of unique educational response in Amadora, Portugal which brings together the reception, integration and learning of the language of schooling with an appreciation of diverse cultural identity and individual knowledge and experience. Welcome Class was initiated and developed in 2010 by two teachers with a group of students from African countries. It has expanded in terms of participant numbers from an initial 13 students in 2010/11 to 49 students in 2015/16. The Welcome Class represents from the social point of view, a methodology for social integration and from the cultural point of view, a process for growing respect for the other, their values, beliefs and cultural habits. To expand and support emerging multilingualism in schools. Provide learning of Portuguese as a second language. To assess individual language proficiency and develop learning plans. To form a bridge to wider academic success. To reduce academic failure and school leaving. Flexibility is built into the programme to cater to individual learning needs and circumstances. 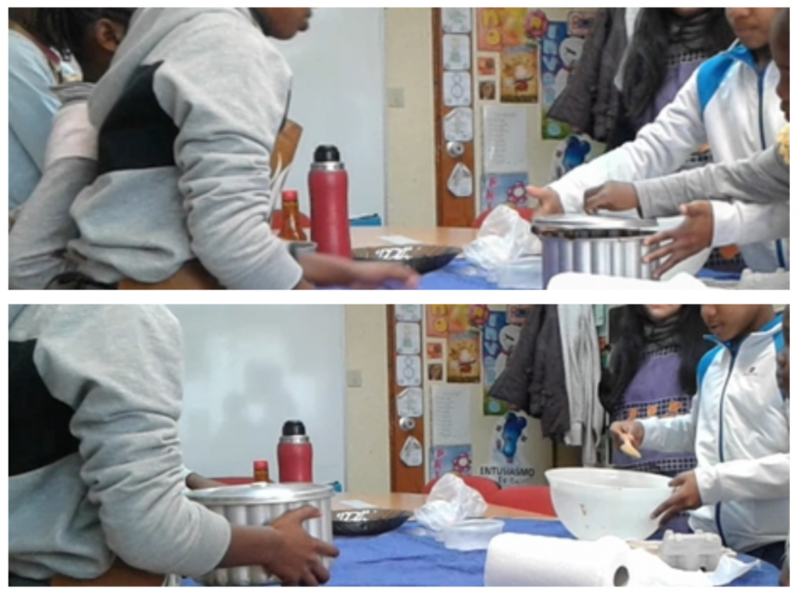 Students are able to join the class at any time during the year and the length that they participate in the programme is fluid, dictated by their own learning requirements. The cultural background of the student and their individual personality and experience are taken into account in order to draw up an individual learning plan. An assessment of the individual’s linguistic profile and knowledge including prior knowledge of Portuguese and knowledge of other languages, educational background and learning styles is undertaken. Additionally, students undertake linguistic proficiency tests which determine the student’s linguistic profile, and the learning process is adjusted around this indicator. Recognition of the learners’ previous knowledge and the planned sequence of learning, is expressed in a matrix called the discovery of ∞ directions. The Common European Framework of Reference for Languages indicates the urgency of learning so that the immigrant students are constructors of their learning process, “mobilizing cognitive, affective resources and the whole of their capacities “. 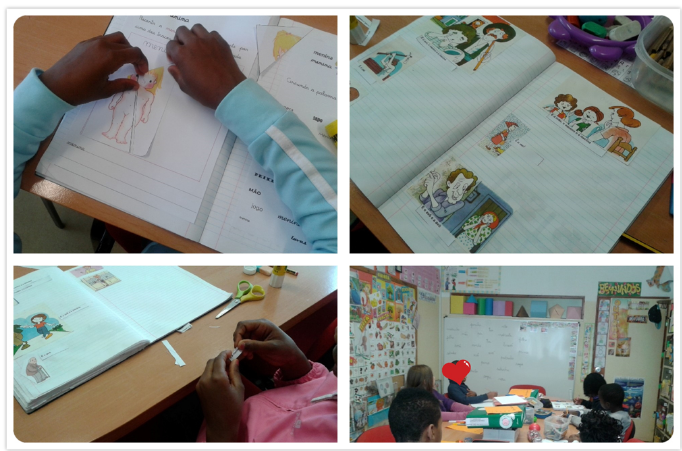 Students are able to stay in the class until they have acquired sufficient language skills to function fully in the Portuguese education system. This language learning is intrinsically linked to the language of schooling and subject learning as well as helping students adapt to host countries teaching/learning methodologies. A priority in early stages of the learning process is to develop communicative skills with a focus on spoken language. According to Tafoi, “The orality, whose competences are little valued in comparison with other domains of the language, implies the adaptation of the language to the situations and the acts of speech, which endow the immigrant student with a tool of communicative interaction with the school and social environment…. The progressive mastery of orality is the tool of cultural and social integration in the development of new language learning that the immigrant student should not forget “. The class facilitates conversational interactions- the development of the expressive abilities of the student in listening and speaking including the expression of opinions, feelings and thoughts and the minimisation of ambiguities of discourse. Promoting formal and informal processes for improving oral competence and reinforcing relationships of trust minimises feelings of inferiority and insecurity and helps build confidence and fluency. 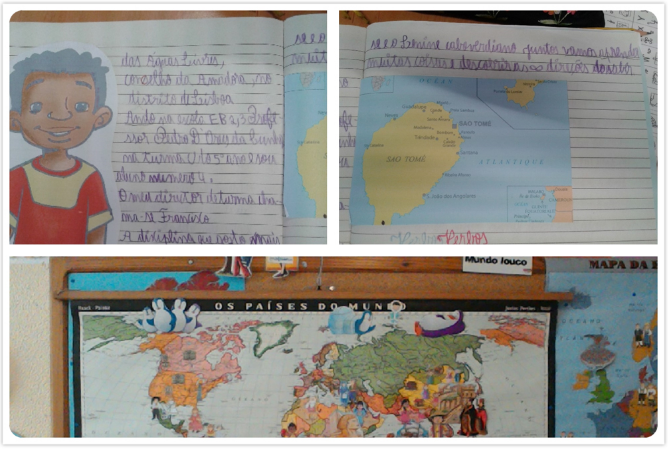 In terms of reading and writing, the learning process breaks down the specific context of the Portuguese language with an alphabetical system, with graphemes and phonemes. This structure and foundation may be very different to the mother tongues of students. A careful selection of texts to develop reading skills is important in terms of student motivation and quality of learning. This enables a better mastery of the different levels of decoding involved in understanding and appreciating the texts. The development of writing skills though improving competence in written Portuguese involves learning to express, organise and structure ideas into a coherent and logical order. This improvement of writing skills is a competence important to the successful study of all disciplines and not only Portuguese language learning. Grammatical competence is developed around learning and practising rules of directionality, word order, readability, correct grapheme / phoneme correspondence, the syllabic division, the translineation and the rules of organization of the sentence. Tafoi asserts, « The cognitive and the linguistic abilities that the immigrant student develops in the act of learning to read and write, and for which skills of knowing how to listen and of producing communicative discourse in another language are required, obliges them to pay attention to the form of articulation of words and the beauty of the relationships established between them, giving meaning to the written material, to the understanding and appreciation of what it reads ». On reflection, the experience of Welcome Class verifies the importance of students’ involvement in the construction of knowledge and language learning education process and this improves the lexical and conceptual basis for understanding the other curricular subjects. Welcome class teachers emphasise the importance of including the skills associated with multicultural teaching environments and methodologies of multicultural learning form part a key part of teacher training and continuing professional development. 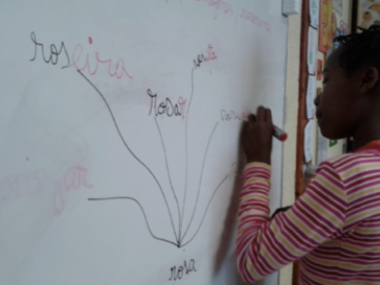 Photos are taken from the Damaia Schools Grouping in Amadora (PT). Uncategorized , education, integration, migration, refugees.